Reference Material For Filmmakers | Cappa Toons! This is a past post where I talk about the structure of the famous truck chase sequence from Raiders of the Lost Ark. It doesn’t just talk about the structure, but also the importance of it’s place in the story. I find this of interest because of the geography of shooting, and how the scouting of different locations influenced the plot of the final film. 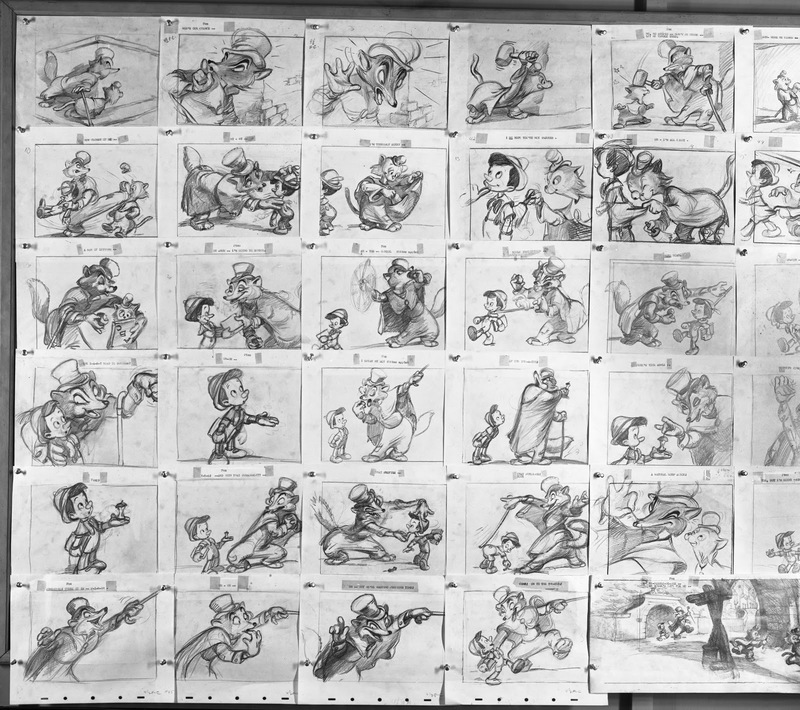 Beautiful storyboards from Disney’s Pinocchio, where Pinocchio meets J. Worthington Fox and Gideon the cat. Live close to Hollywood? Come join Hollywood Party, The Official Laurel and Hardy Club (part of the association known as Sons of The Desert). Meetings are every 2 months at the Laskey/Demille Barn across from the Hollywood Bowl, and here you can watch beautiful 35mm prints on a big screen of Laurel and Hardy’s greatest shorts, as well as a variety of comedy shorts from the Hal Roach Studios (including Our Gang/The Little Rascals, Thelma Todd/Zazu Pitts, Charley Chase, and many more). There’s also a classic cartoon shown along with the program. It’s a terrific place way to gain exposure to the films of one of the greatest classic comedy studios of the 1920’s and 30’s. Click the Banner below for the official website! Have you feared your loved ones would have to put you in a padded room for loving horror films a little too much? Fear not! There’s an incredible podcast series online just for you, dedicated to not only feature length commentary about the greatest horror films ever made, but you will learn about the history of these films, the effort that went into the production of these films, and the questions you’ve been dying to know…why do we love horror films and how do they help us deal with our fears in real life? Jason and Matt have the answers for you! Click the banner below and check it out!